While it can be problematic at times for the NBA to advertise its star players, the league has managed its presentation of the players as well as any professional sport. In fact, it is fascinating to note exactly how the media and league markets certain players. There are narratives constantly being told that shape our perceptions and inform our opinions of individuals in the NBA. For example, when Jeremy Lin’s rise to fame turned into Linsanity for the Knicks, one of the recurring stories explained that Lin had been sleeping on his brother’s couch. Lin’s incredible story was framed as a rags-to-riches narrative, an American favorite. From the moment that story was released, the media labeled Jeremy Lin as an improbable success story, we accepted the narrative, and he became a media sensation and a kind of culture hero. Kevin Durant, a far more popular player than Lin, has always been considered a nice guy, and fans laud him as an embodiment of hard work, success, and positive behavior. Durant’s demeanor on the court is typically quiet and collected, and during interviews he emphasizes his teammates more than his own play. 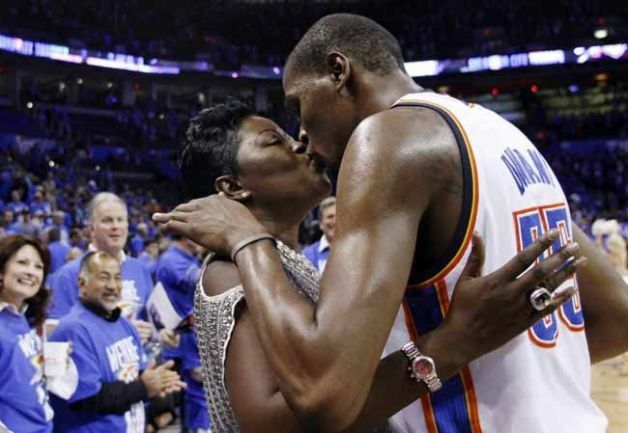 Adding to his “nice-guy” resumé as a good-natured family-man, it is widely known that Durant kisses his mother after each game. Clearly Durant does a good job of presenting himself as a model citizen, which the media has embraced as his label. It seems impossible to watch a Thunder game on TV without the commentators mentioning how the Thunder organization emphasizes core values of hard work, citizenship, and teamwork. Naturally, the discussion turns to the Thunder’s best player, Durant, and the ways that he embodies these characteristics. Interestingly, Durant has more technical fouls this season than his teammate, Kendrick Perkins, who has been referred to as an enforcer and an “old-school tough guy.” Of course, the same commentators would explain Durant’s technical fouls as showing his competitive nature, which maintains their overall presentation of Durant as a good guy. While there is no use arguing that Durant is not actually a good guy, it is important to note how the media maintains certain narratives about certain players – and how those stories decide who we portray as culture heroes. such a good perspective. really never thought of it that way.